I’m still on holiday and still getting by with ebooks, though I am starting to miss the greater variety offered by the normal, physical library collection. Ebooks are awfully convenient but the selection is still sadly limited! More Baths, Less Talking by Nick Hornby – a collection of Hornby’s bookish columns for the Believer, full of many great reading recommendations. 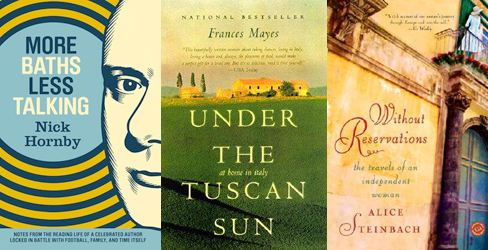 Under the Tuscan Sun by Frances Mayes – I have never read this, though I love the class of books its success inspired. Without Reservations by Alice Steinbach – a travel memoir by an American journalist who took a sabbatical and travelled around Europe on her own for several months. Alice Steinbach has been one of my favourite authors for awhile. She really only had 3 books published. This is the first one you have found at the library. She did a sequel to it and you find out what happened to her Japanese relationship and she also did a book of short stories. Sadly she died and there will be no more books. I loved her. I hope you do too. Like Pam, I loved Alice Steinbach’s writing too. Without Reservations was one of the first travel memoirs that I read and I loved the sense of liberation that came with reading the book. It also inspired my love for writing postcards while travelling. Hope you will enjoy it, too! Your Hornby book just might interest my husband so I must have a gander at my library catalogue. As for me, this week there is a stack of Pym’s lying on the dining room table – thinking ahead for Thomas’s Pym reading week come June! I have read two of these three books (indeed, they are on my shelves.) The Alice Steinbach and the Frances Mayes. I am truly shocked to learn from Pam Travellin Penguin that Alice has died – when was this, Pam? Alice and I had a brief email correspondence when I wrote to her to tell her how much I enjoyed her books. I’m really sorry to learn of her death. I loved Without Reservation, and the follow up to this. As for me, I’ve just bought Jane Rusbridge’s The Devil’s Music and am currently reading Simone St James’s An Enqjuiry into Love and Death which I’m very much enjoying even though there are (what are to me) errors. For a book set in the west country in England in 1924 someone would not “wander[ed] the aisles looking for tins of cat food” – we didn’t have what is obviously a mini market then (they came in during the 1950s) and I’m not altogether certain whether we had tinned pet food as early as 1924, but I’d have to check that out; also, a book could not “be bought at any common paperback stand” in 1924. Paperbacks as we know them were first on the markekt in 1935, not 1924 – they were the first Penguins. But the story is entertaining and I’m not going to let little things like this put me off Simone St James’s work. PS I have just looked up the death of Alice Steinbach on the ‘net and found that she died a year ago this month, aged 78, from cancer. Her book Without Reservations is a joy from beginning to end. Great books. My mother read and reread and watched and rewatched Under the Tuscan Sun and loved them both. I love Nick Hornby’s essays on books for The Believer. I have passed The Polysyllabic Spree to anyone who loves books or music. I can not believe I didn’t know there was another edition. I will be racing to get my copy of More Baths Less Talking! Great stack! I haven’t read anything by Steinbach yet though I did just by her book, Educating Alice. I’m hoping to read that and More Baths Less Talking soon. Happy reading. I enjoyed Under the Tuscan Sun. Alice Steinbach is a new name to me and checking the library catalogue they only have one – Educating Alice – so I might try that. Happy reading! I tried to read Under The Tuscan Sun years ago and couldn’t get into it. I should try again some time.. maybe the timing just wasn’t right for me. Under the Tuscan sun made me want to up and go! I loved the book. Enjoy your holiday. on March 15, 2013 at 11:49 | Reply Lorraine S.
I’ve read all of Frances Mayes’ books. You really feel like your travelling around Italy with a lovely, intelligent and happy woman along with her husband. Forget the movie!